It’s that frenetic time again. In only a few short weeks we’ll be photographing our next fall line. Every season I swear I’ll cut back and not knit as much – especially at the last minute – but when it comes down to it, I can’t help myself. 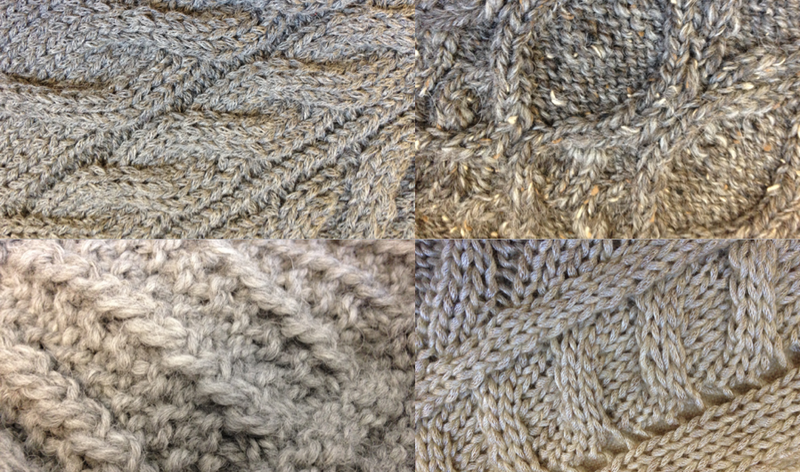 We’ve got so many nice new yarns and the deadlines were shorter than ever (due to an unusual trade show schedule). I also use the excuse that there are some techniques I just want to prove out myself, so I can change my mind midstream. Actually, the whole design room is resembling a cottage industry these days. Emily is perfecting a pair of mittens while researching great photo locations. Martha is adding a few rows to a really lovely Cirrus cowl every afternoon while she wraps up the day’s pattern support questions. Brenda alternates writing the next KnitBits free pattern with swatching on a clever new shawl concept. I’m still getting the last finishing details of sweaters for NG volume 15 to my knitters and making cable charts for some hats I’ll be knitting at in front of Hulu this week. I am knitting every weeknight and even more on the weekends. This past weekend, John and I flitted from one family event (my father-in-law’s 86th birthday party in NH on Saturday) to another (Sunday lunch with 4 of the grandbabies in CT), making the grand tour of New England. Luckily for me, that meant that I had about 9 hours of knitting time in the car! I can’t work on complicated things in these circumstances, but I was knitting a pullover with just a bit of patterning down the front, so I could handle it. I just wish I could say the same for my needles! There I was with a couple hundred stitches, going around and around. 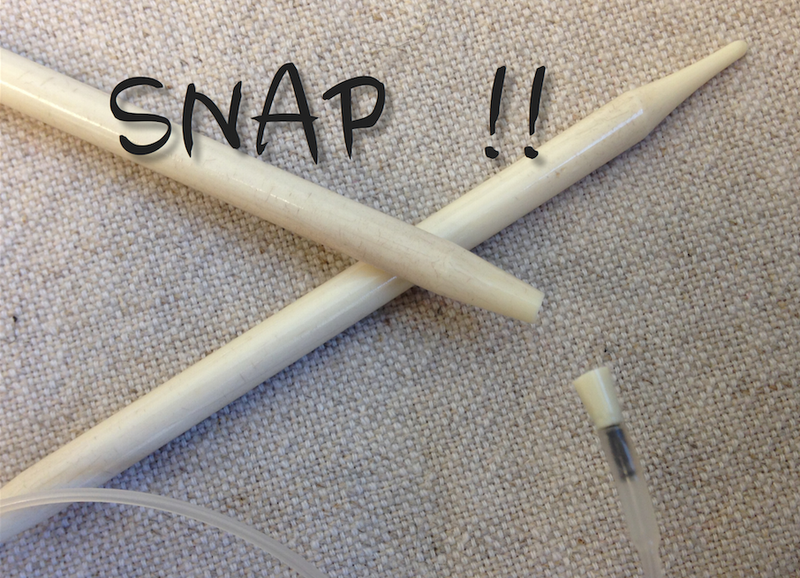 I was starting to make progress when SNAP, the last 4 inches broke clear off my old “Baleen” knitting needle (which are actually made of casein, not whale parts). They’re from the 80s and are famous for breaking in the cold. When my knitting collapsed in my lap, I collapsed along with it (after shouting out a bit of an expletive). Then I remembered that I had my Denise 2go needle set in my bag. They saved the day! A few hours later, we were back home and the sweater was almost done. Speaking of the upcoming photo shoot – does anyone have any suggestions for photo locations in and about RI? Any Mediterranean villas? Any lakes with hills behind them? Wish I could still purchase Baleen needles! I still have a few and use them only in the safety of my home. The tips are (were) wonderful, with that slightly dished out shape. I momentarily forgot how easily they break. Left my whole project (a cowl-in-progress) at a gas station/convenience store in Bakersfield. Besides the cowl & yarn, lost a great needle, stitch markers and a row counter. I’ve always wished I could knit in the car. It’s a no-go for me. I can sympathize! I’m ok if I don’t look down much.